Who doesn't like kingfishers? They're interesting, colorful, have fascinating habitats, and look, well, funny. Too bad they don't like us. Or anything else, for that matter. Kingfishers are one of the more antisocial families of birds - they don't even like each other, most of the time. Loners through and through, once the brief breeding season has ended, they revert to their solitary ways. Ever been walking along a stream or lake, when you heard the loud rattling of a Belted Kingfisher? It was likely YOU that it's cursing. They don't like intruders in their turf, and will vigorously scold anyone or anything that irks them. Female Belted Kingfisher. Males are less gaudy, having only one blue belt. This species is tough for a bird that depends on diving into the water to procure prey. They'll tough it out in northern latitudes, as far as they can dependably find water. If she spots a creek chub or some other tasty fish, she'll hover briefly over the target, then plunge headlong into the icy waters. Just before striking the water, the bird will close its inner eyelids, and then snap up the fish with its pincer-like bill. The hapless victim with then be flown to a convenient perch, and likely beaten mightily against the branch until thoroughly stunned, then it'll be swallowed. Don't come back as a minnow and let yourself fall into the sights of a kingfisher. Ringed Kingfisher - like a Belted Kingfisher on steroids. These monsters are pretty common throughout Mexico and Central America, and on into South America. There should be no confusion with Belteds; Ringeds weigh nearly twice as much, and look very bulky. They make a really loud staccato machine gun-like rattle. Ringed Kingfishers are a lot like Belteds in that they often favor conspicuous perches, are quite vocal, and generally can't be missed. That's certainly not the case with all of the kingfishers. I took this shot last February in Costa Rica. With luck, I'll be seeing more of them within the next day or two. 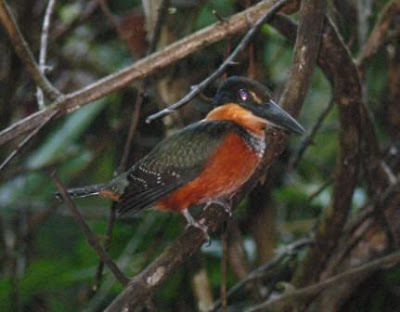 The furtive Green-and Rufous Kingfisher - a jawdropper of a beauty. There are about 90 species of kingfishers worldwide, and this one has to rank near the top in good looks. They favor dense jungle, and tend to hunt from gloomy, shady spots, thus they're often tough to see. G & R's aren't particularly common, but range over a wide swath of Central and South America. I got this shot in 2006 from a boat, as we explored the jungle canals of Tortuguero National Park in Costa Rica. I'll be back in this same jungle in a few days, and will hope to see more Green-and-rufous Kingfishers. 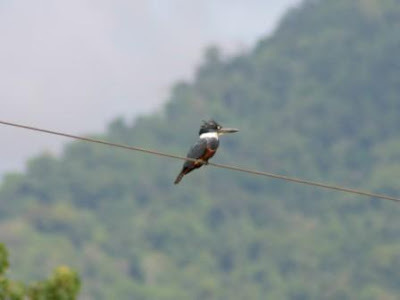 Amazon Kingfisher, which looks like a large Green Kingfisher. It's a bit smaller than a Belted Kingfisher. They occur from southern Mexico on south to Argentina. They're pretty common in Costa Rica, and won't be missed. 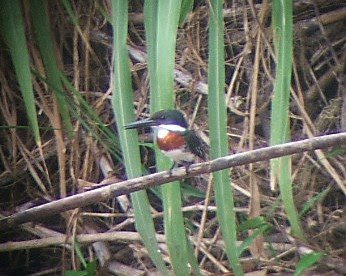 I regret that I wasn't able to get a photo of my favorite kingfisher - the American Pygmy Kingfisher. These micro-divers are as cool as birds get. They're only five inches long, and weigh about the same as a Song Sparrow. Pygmys aren't rare, but they frequent the impenetrable mangrove thickets along the coasts of Costa Rica, and thus can be easy to miss. We had wonderful views of one in '06, and will be back in good habitat for them on this trip. I'll be trying for some good photos. Internet access is iffy where I'll be, but if the forces conspire to allow me to connect to the Internet, I'll try and toss up some photos of a much warmer place than Ohio! On a bit of a blog tear here, as I leave for nearly two weeks in Costa Rica first thing Tuesday morning. Internet access is often iffy where we'll be, so hence the prolific - for me, anyway - posts. And please, do not feel too sorry for me, bailing on this subzero midwestern U.S. weather to spend time in lush tropical haunts in balmy temperatures with toucans, chlorophonias, sunbitterns, flowering plants, more butterflies than can be believed, etc., etc. Please, no crocodile tears for me. Tom Ruggles of Muskingum County recently sent along a photo of a most unusual Northern Cardinal that has been visiting his feeders. It's yellow. Or at least strongly yellowish. Such a beast would certainly be eye-catching, and raise obvious questions. Why is this normally brilliant red bird yellow? Tom's lutino cardinal. "Lutea" is latin for yellow, thus the term lutino. 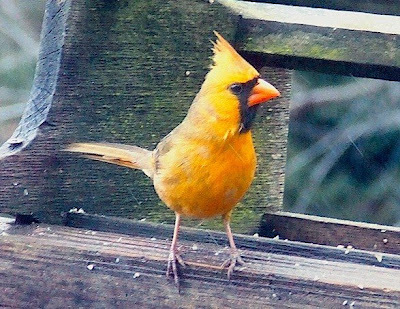 This cardinal is exhibiting a condition known as xanthochroism, a genetic anomaly that causes an excess of yellow pigments to show through. It may be caused by darker pigments being suppressed, thus permitting less dominant colorations to shine through. If we are to get a bit propeller-headed here, the bright red plumage of Northern Cardinals is caused by at least nine different carotenoid pigments. Knock one or some of them out of whack, and we can end up with the bird in the photo or something similar. In my previous post, there is a (bad) photo of a heavily leucistic Red-tailed Hawk. That bird is displaying the effects of yet another genetic anomaly, but one that causes the individual to appear much whiter or paler than normal. Carotenoids occur in plants and some animals, and birds uptake them as part of their natural diet. It's possible that xanthochroic individuals, like Tom's cardinal, result from dietary deficiencies. A well-known example of the role of carotenoids and bird coloration involves flamingos. If deprived of the blue-green algae and brine shrimp that are rich in beta carotenes that gives them their bright pink plumage, the birds become pale and whitish. By providing captive flamingos with a compound called canthaxanthin, the rich pink coloration can be restored. Xanthochroism has been documented in a number of bird species, in addition to Northern Cardinals, including: House Finch, Cape May Warbler, Scarlet Tanager, and Red-bellied Woodpecker. Thanks to Tom for sharing this interesting bird! I am very grateful to be writing this from a place of warmth. Because, yesterday, it was anything but warm and I think I'm still thawing out. For the past four years, the Ohio Ornithological Society has organized a Winter Raptor Extravaganza in partnership with the Wilds. The latter organizations is a large animal conservation facility that occupies some ten thousand acres of reclaimed strip mine land, and this habitat often supports lots of raptors. Birds of prey numbers vary from winter to winter, depending on population levels of meadow voles - little furry sausages with legs that have periodic peaks and crashes. In total, we had just over 200 people register for yesterday's field trip. Mortality was high - about 115 ended up showing. The no-shows and cancellations were perhaps the smarter ones, and better able to understand weather reports. At our rendezvous time at 9 am, the temperature was about 10 or 12 BELOW zero! This is serious cold by any reckoning. But most everyone stuck it out until mid-afternoon, and I know my group probably spent more time outside the vehicles than in. By later afternoon, it had warmed to the low 20's, but the wind had picked up, cancelling out any increased warmth in the ambient air temperature. The Arctic-like landscape of the Wilds in below zero temperatures. Looks cold, eh? It was. A view of the parking lot just before we got going at 9 am. We were amazed so many hardy souls showed, but are glad they did. Birds were a bit sparse, and who can blame them? Many will often reduce activity to cope with such extreme temperatures and finding them can be more difficult. But find birds we did, and there was some good stuff tallied. A BIG thanks to everyone who made this expedition possible. On the OOS side, Marc Nolls was his usual extremely organized self, and did a fantastic job. 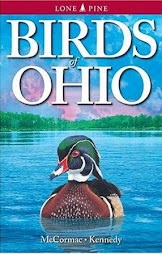 Cheryl Harner also helped a lot, and we were fortunate to have the services of a veritable who's who of Ohio's best birders to lead trips and find birds. They include, in no particular order, Janet Creamer, Ethan Kistler, Brad Wilkinson, Andy Jones, Kathy Mock, Bob Placier, Dana Bollin, Sheryl Young, Jim McCarty, Bret McCarty, Hugh Rose, Judy Kolo-Rose, Glenn Crippen, Tom Bain, Jackie Bain, Bill Jordan, Laura Jordan, Ed Pitts, Carole Pitts, and Jason Larson. Very sorry if I inadvertently omitted anyone! We really appreciate the support of the Wilds as well. They are very accommodating of the birding community, and provide lots of logistical support for our winter outings. Special thanks to Troy Burch for being our liaison and lunchtime speaker, and his co-worker Denise. Nicole Cavender, Director of Restoration Ecology at the Wilds, for supporting avian conservation and promoting birding. Finally, kudos to Al Parker for really creating the birder/Wilds connection way back when. Here's our group, scanning for the Golden Eagle. I think it had warmed to 5 below by this point. No eagle for our group, although others saw it. These are big, tough birds, but even they might balk a bit about soaring about in such temperatures. One of the more interesting finds for us was this gorgeous, heavily leucistic Red-tailed Hawk. Some of the flight feathers were brown, as was most of the head, and the upper tail was reddish, but other than that it was ghostly white. We also saw plenty of Rough-legged Hawks - both light and dark morphs - some Northern Harriers, American Kestrels, and normal-looking Red-tails. Jim and Bret McCarty's group had a Merlin - always a great midwinter bird at the Wilds. And a smattering of Short-eared Owls were seen. This crew was an interesting sight for our group. The Wild hosts about 30 species of large animals, and these African Wild Dogs are among the more interesting. They were hardly put off by the frosty temps, and seemed very excited to see us. They no doubt would have been more excited to see one of us inside the pen, as they could have then practiced their social pack-hunting skills. Closer view of the African Wild Dogs adding us to their lists. The large, round ears are distinctive, and rather Mickey Mouse-like. They are sometimes called painted dogs due the the bright patchy colors of their pelage. One of the Cheetahs was out roaming in the area beyond the dogs. One never knows what one might see on the Wilds landscape. If you've never done so, I'd strongly recommend taking a tour of the place. We packed into one of the buildings for lunch, in two shifts as we couldn't all fit in at once. Troy Burch gave both groups an excellent program about the Wilds and it's mission. The wide-open landscape of the Wilds and the thousands of similar reclaimed strip mine lands owned by American Electric Power make for excellent American Kestrel habitat. There's but one problem - kestrels need cavities for nesting, and those are in short supply in these places. To try and remedy this situation, the Ohio Ornithological Society, the Wilds, and American Electric Power joined forces and worked together to create a "trail" of kestrel nest boxes, such as the one that your blogger is posing with. There are about twenty of these spread around the area, and 2009 will be the first nesting season that they'll be available to the kestrels. We hope some of these beautiful little falcons - which seem to be declining rapidly - take us up on our offer. The same trio of partners also erected a number of large-telephone-sized raptor perches in the most open, perch-free areas, and these should provide additional favored hunting spots for birds like Rough-legged and Red-tailed Hawks, and perhaps even Golden Eagles. A big thanks to everyone who came out yesterday - hope your feet are unfrozen by now! Mentor Headlands, Ohio, October 29, 2006. A fearsome storm had just rolled in off Lake Erie, and was still clearing out to the south. To the north were clear blue skies; the southern part of the skyscape was still dominated by ominous black clouds. For those of you in warm climes, be grateful you aren't in central Ohio right now. Temperatures plummeted to minus 12 degrees fahrenheit here last night. That's bone-cracking cold. Cars don't even work very well at those temps, as joints, bearings, and fluids never really get beyond the sluggish viscous stage. Nonetheless, the world's toughest Baltimore Oriole survived the night and is visiting his patron's feeders today. Go, oriole! Costa Rica - leaving next Tuesday - has never looked so good! The cavalcade of interesting conferences and symposia is rapidly coming down the pike, and I'll plug them here from time to time. Here's one that you won't want to miss: The annual Ohio Natural History Conference, sponsored by the Ohio Biological Survey and the Ohio Division of Wildlife. This conference is always interesting, and full of great speakers on all manner of topics. To add to the allure, it is held at the always interesting Ohio Historical Society building, a very apropos venue for this affair. Just CLICK HERE for the complete skinny, and to register. I was especially pleased to learn that Gary Meszaros is the keynote speaker. Gary is one of North America's premier wildlife photographers, and his images are sure to dazzle. 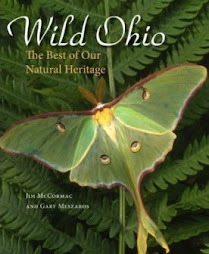 We collaborated on a book entitled Wild Ohio: The Best of Our Natural Heritage, which should be released early this spring, from Kent State University Press. 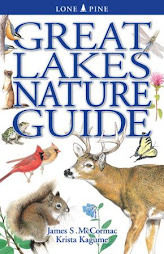 The book is a romp through forty of Ohio's very best remaining natural areas, and is full of Gary's wonderful imagery. Below is a taste of some of Meszaros' work, which will appear in our book, and is the sort of stuff you can expect to see at his program at the Ohio Natural History Conference. 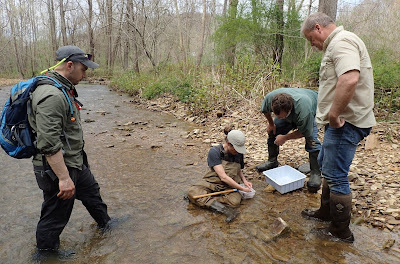 Five species of dace inhabit Ohio streams. 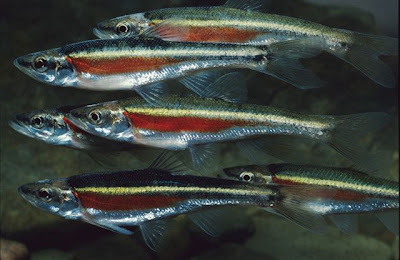 Breeding in clear pools, redside dace populations are found along the unglaciated Allegheny Plateau. Wild lupine, with its racemes of blue flowers, contrasts with the orange flowers of plains puccoon. Both plants are rare in Ohio. 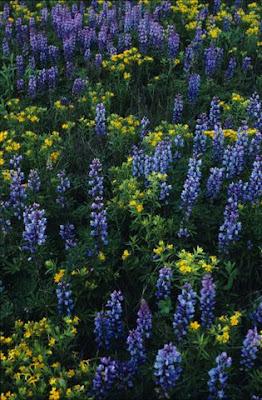 Wild lupine is the host plant for the endangered Karner blue butterfly. The small fringed gentian appears in late summer, growing in wet meadows and seeps. 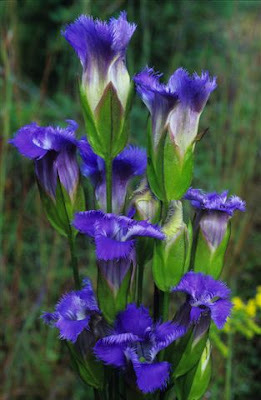 The beauty of this plant inspired poet William Cullen Bryant to pen a poem entitled “To the Fringed Gentian”. 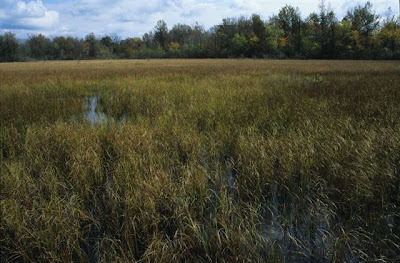 The dominant plant in the wet meadows at Irwin Prairie is a sedge; twig-rush. The yellow rail may be the most significant bird species occurring here. There are more records of this secretive bird at Irwin Prairie than any other Ohio locale. Wilson’s snipe are at the extreme southern end of their breeding range in Ohio. 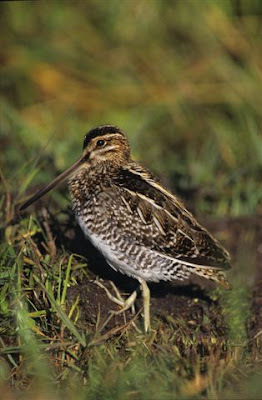 Irwin Prairie is one of few reliable sites where the peculiar aerial courtship displays of male snipe can be observed. On a recent foray into the backwoods of Hocking County, I had the good fortune of happening onto a most cooperative Northern Mockingbird. You may know the species, which is a mimic extraordinaire. Indeed, it's scientific moniker is Mimus polyglottos: roughly, mimic of many voices. Handsome mockingbird scopes us out. Curious and inquisitive, mockers will often closely investigate those who invade their turf. This one wasn't singing, but when they do, it's time well spent listening to their varied repertoire. An individual can retain something on the order of 200 distinct "songs", or imitatations. Like Rich Little, a skilled mockingbird can ape almost anything. I am fortunate to have a resident mockingbird where I live, and often pause to listen to him. You name it, he picks up it up and parrots it back. Predictable imitations are of common birds that he would frequently hear: Carolina Chickadee, Eastern Meadowlark, Northern Cardinal, Blue Jay, and so on. But I have been quite impressed when he pulls off a masterful rendition of the local garbage truck's backup warning beep, or a decent version of the fire truck's siren. And they can be persistent, like the semi-drunken Karaoke singer who won't shut up. Unmated males, especially, are prone to singing all night, often from the summit of one's chimney. Northern Mockingbirds are really southerners, at least to those of us at the latitude of Ohio. They have expanded northward with the clearing of the great deciduous forest that once blanketed much of the eastern U.S., as openings, fields, and thickets were created. Ohio is on the cusp of their northward advance; in southern counties they are quite common, but along Lake Erie they are rare and noteworthy. Handsome bloke, eh? He was pretty much getting in our faces, as mockers are wont to do to perceived intruders. They don't tolerate interlopers readily, and stories of mockingbird bravado are legion. When I was a kid growing up in Worthington, Ohio, we had a cat named Inky. Tough as nails and seemingly bulletproof, Inky intimidated nearly everyone and everything he encountered. Big, coal-black, with shining yellow eyes, he struck fear into dogs, cats, and people. I remember, as a little boy, occasional times laying on the couch watching the tube when Inky would decide to use me as a pillow. Up he'd come, sprawling on my chest with a paw around either side of my neck, his face with those glowing yellow eyes just inches from my worried face. I didn't dare move a muscle, for fear of the fallout if I displeased Inky. Once, I made a move he disapproved of - I was probably trying to breath or something - when blanketed by this savage. He promptly lunged forward and bit me on the nose - hard! The quintessential alleycat scrapper, Inky routinely made a point of showing lesser neighborhood cats who the Alpha was. Frequent were the nighttime wails of flailing felines, and over the years the Inkster developed some distinctive battle scars, such as permanently shredded ears. In a true story that had to be seen to be believed, Inky would toy ruthlessly with the neighbor's pack of terriers. They raised scads of these medium-sized annoying yipsters, and when the mob would spot Inky strolling in our backyard, a cacophony of yaps would go up and the canine pipsqueaks would all roar over to the fence and set up a racket, Inky being the target of their wrath. Of course, the dogs were safely ensconced behind their six-foot chain link fence - little bullies with big talk. So, Inky would casually stroll over to the fence, and then - believe me or not - make one of those fantastic, graceful leaps that cats do so well, and suddenly he is ON TOP of the fence. Now, the volume control on the terrier brigade has gone from seven to ten, and they are practically apoplectic over this cat who is so clearly disrespecting them. After a short waltz along the fence top, seemingly oblivious to the chattering fools below, Inky would pause for good effect, and drop gracefully into the terrier's yard! Told ya, you'd have to see it to believe it! Suddenly, as if by magic, the six or eight dogs suddenly remembered all of the chores they had forgotten or other duties left undone. The yipping stopped, and dogs rather quickly sauntered off here and there, but with one common orientation - away from the cat. And Inky, the Clint Eastwood of felines, leisurely poked his way through the yard, probably hoping one of those fuzzy punks would make his day, and jumped across the fence on the opposite side. You get my point. This was one tough cat. But not to our local mockingbird. The mocker despised Inky with a passion, and lost no opportunity to make his displeasure of the cat known. In fact, I think that bird was the only animal I ever saw that cowed the Inkster. I remember being astonished, the first time I saw this, hearing the mockingbird making all sorts of racket, and looking out to see why. There was Inky, trapped under a lawn chair and looking frazzled, while the mocker let him have it with every curse in his stable. The bird would sit right on the back of the chair, yammering away, and when Inky made an effort to run to other cover, the mocker was right on him, swooping low like a feathered dive-bomber and trying to peck the poor beast. I hope the terriers weren't watching. It is with sadness that I report the passing of Keith “Archie” Archibald. Below are some of my thoughts about “Arch”, along with some information provided by his good friend, Dr. Bernie Master. I first met Archie formally through Bernie, and he was one of those guys that everyone liked. Always unfailing polite and interested in everyone. It was fascinating to hear his tales from the old days, when he was often out in the field with the legendary Ohio ornithologist Milton B. Trautman. To the end, Archie remained smitten with birds, and still went afield looking for them up until the last year or so of his long, productive life. He was the last of "The (Milt) Trautman" group. They birded every weekend and more covering all the known haunts and some not so known, during the 50's, 60's, 70's, and 80's. They made innumerable record contributions to the Ohio ornithological record. Archie himself remembered perfectly the rarities they would find and all the circumstances surrounding the finds. Archie and the group were early and constant Green Lawn Cemetery birding devotees. The others were Milt, John Strittmatter, Cloyd and Mark Dawson. I believe Archie was the last birder to see Smith's Longspurs in Ohio down around Charlie's Pond. No finer person ever existed. Always had a kind word and easy smile for everyone. Survived by his wife of 61 years, Rose. ARCHIBALD Charles Keith Archibald, 87, of Columbus went to be with the Lord after his sudden passing on Monday, January 5, 2009. He was born in Charleston, WV on August 5, 1921, the son of Edward and Lelia Archibald. He proudly entered the U.S. Navy in 1942 where he served as a First Class Torpedoman aboard the U.S.S. Hunt and the U.S.S. Dixie in the Pacific during World War II. During his service, he married the love of his life, Rose Dalzell in a double wedding ceremony with Rose's twin sister in Mount Vernon, NY on October 18, 1947. He was honorably discharged from the U.S. Navy in 1948 after being awarded the Navy Good Conduct, American Campaign, Asiatic Pacific, Victory, Philippine Liberation, Philippine Independence and the Cold War Commemorative Medals. He was later entered into the World War II Memorial Registry of Remembrances in memory and honor of the courage and sacrifices made during World War II. Keith and Rose resided in Columbus where Keith worked for Jaeger Machine Company before retiring after 42 years of service. He was active in his church, Calvin Presbyterian, since 1967 where he served as head usher and was an important figure in the Men's Fellowship. He is survived by his dear wife of 61 years, Rose; sister Lelia Eichenberger; sister-in-law Betty Bellesheim; brother-in-law Fred Dalzell; numerous nieces; nephews; great nieces; great nephews; great-great nieces; and many close friends. He is preceded in death by his parents, brothers Robert, Richard, George, and Arnold Archibald, brothers Thomas and John Richardson, sisters Eunice Goedeking and Julia Dykes, and great niece Leslie Whiteman. He was like a father to many and will be sadly missed. Keith was an avid bird watcher for over 20 years and derived great enjoyment from his travels with Rose. Down with the House Sparrow! Good ole Passer domesticus. Without doubt, one of the most reviled of North American birds, despised by bluebirders and anyone with a liking for cavity-nesting birds, and persecuted by various store-owning merchants. Personally, I admire these little beasts greatly. They are the avian counterparts of cockroaches. Survivors. If an ornithological Armageddon occurs, my money is on the House Sparrow as the last one standing. They can live nearly anywhere. Deep in coal mines. The most urban of 'hoods. Isolated farms in agricultural boondocks. Enterprising House Sparrows now even eke out a living in the bowels of giant box stores, resting in the rafters and sweeping down for cleanups on aisle six. But the common denominator with these industrious survivors is people. They are seldom far from our shadow. An interesting thread began today on the Ohio Birds Listerv by a gentleman who noted what seemed like a shortage of House Sparrows recently. This was an astute observation and he is exactly right. House Sparrows, by almost all reckoning of long-term data, are indeed on the downswing, in Ohio and most of North America. Handsome, jaunty male House Sparrow, photo courtesy of Wikipedia. Actually a very good-looking bird! In 1851, a Mr. Nicolas Pike obtained 100 of these birds at $2.00 a pop - $200.00 for the lot. He then released them in Brooklyn, New York in late 1851 and early in 1852, and the rest is history. House Sparrows quickly usurped a void not filled by our native birds - heavily human-modified habitats. This is why they were so successful so quickly, just as have been many Eurasian weeds. These species of Europe have been adapted to the disturbance wrought by people for thousands of years, in some cases, while the native North American flora and fauna were not. Thus, aliens like the House Sparrow quickly gained the upper hand in North America's newly peopled landscapes. 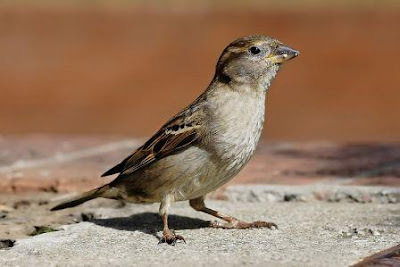 Lovely female House Sparrow, photo once again courtesy of Wikipedia. But now, these interesting weaver finch allies (they are not true sparrows) are on the decline. This is not only true in North America, but also in their native range of Europe and Asia, where losses are more disturbing. Many invasive non-native species go through "boom and bust" cycles. They are brought some place new, perhaps exploit an unexploited niche or outcompete the natives that were present, and enjoy a period of largely unchallenged prosperity. Oftentimes, though, Mother Nature eventually marshals her forces, and predators, changes in habitat, and other factors begin to come into play and drive the invaders out. Our longest-running systematic bird survey is the Breeding Bird Survey, whose routes have been run all over North America since 1966. Overall, BBS data has shown a 2.6% annual drop in House Sparrow populations. The National Audubon Society's Christmas Bird Counts have provided a wealth of data on bird populations. 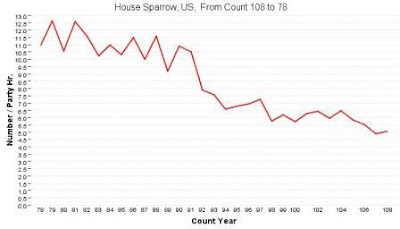 The graph above depicts the last 30 years of data on House Sparrows in the United States. 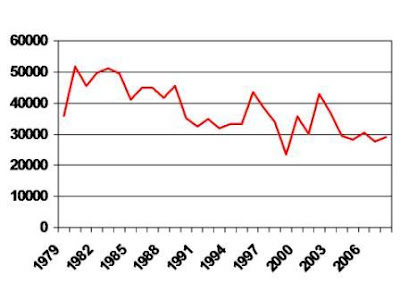 Even though the number of CBC's and observers has increased, the trend is clearly downward for House Sparrows. This is a graph showing the last 30 years of CBC data, published in the Ohio Cardinal for House Sparrows in Ohio, that I put together for the winter 2007-08 winter season issue. And a shameless plug: please support the Ohio Ornithological Society, which publishes the Cardinal, makes possible the Ohio Birds Listserv, produces the quarterly Cerulean newsletter, supports young birders, hosts all manner of interesting conferences, field trips and symposia, and more. JOIN RIGHT HERE! The above chart once again shows a steady downward trajectory for our friend the House Sparrow. No one is certain, but it seems as if much of the drop is in agricultural areas. Cleaner farming practices may be to blame, as technological advances lead to less grain spillage and other waste byproducts which provide much sparrow fodder. Increased use of pesticides which in turn reduce available insects for the birds to forage on also may play a role. Even if a bird species in not native - and much despised to boot - it is still important to monitor their declines and try and ascertain the reasons for drops. 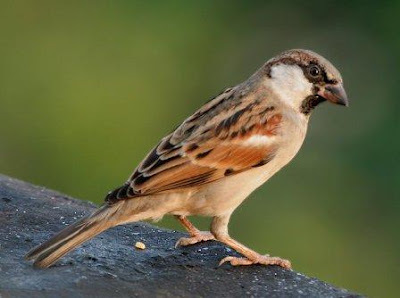 After all, even birds like House Sparrows can be indicators of our ecological health. Let's face it, most thrushes are pansies, at least those of speckled bellies. Shy and skulking, they retreat to hot and humid tropical climes to winter. Not so with the most mellifluous of them all, the Hermit Thrush. These russet-tailed beauties have a song that is breathtaking; almost hard to comprehend in its richness and complexity. And for woodland specklebellied thrushes, they are tough as nails. Hermit Thrushes breed in conifer-dominated boreal forests across northern North America, ranging south at higher elevations in the mountains. In Ohio, they are very rare breeders, with relict populations confined to our largest and most intact hemlock gorges. But we get plenty of them in migration, and more than most people probably realize in winter. This is the only thrush in the genus Catharus that overwinters primarily in North America. But they aren't easy to find in winter, and a bit of botanical knowledge will surely help your efforts if you are interested in unearthing one of these tail-pumpers in the off season. On the Hocking Hills Christmas Bird Count last Saturday, we were delighted to come across this lush patch of Smooth Sumac, Rhus glabra, in heavy fruit. And not just because it is a good-looking plant. Fruiting sumac in winter means Hermit Thrush! Look very closely in the center of the photo, and you may see a little thrush looking back. We zoom in a bit, and now you should be able to make out Mr. Thrush inspecting the interlopers. When we saw this habitat, we proceeded to make some sounds to pique the curiosity of a thrush, and sure enough, out he popped. Unfortunately, Hermit Thrushes won't sing for us in winter, other than rarely a soft whisper version, but they do give their distinctive low chuck notes. Our thrush stayed in rather dense cover, as they usually do, but I was able to zoom in and through the vegetation and capture a decent image. Here he sits on a branch spackled with Green Shield Lichen, Flavoparmelia caperata. There are four common, widespread species of sumac in Ohio: this one, which is the aforementioned Smooth Sumac; Staghorn Sumac, Rhus typhina; Winged Sumac, Rhus copallina; and Fragrant Sumac, Rhus aromatica. All of them provide tasty fruit that are long persistent and offer a stable food source for wintering Hermit Thrushes. So if you would like to add a fairly difficult species to your January Ohio list, just go poking around the sumac patches. Along with Jarel Hilton and Dave Minney, I participated in the fifth Hocking Hills Christmas Bird Count. We found lots of birds, including White-winged Crossbills, Pine Siskins, Red-breasted Nuthatch, and Hermit Thrush. This count is really excellent, and you may wish to put it on your radar screen for 2010. Fortunately for me, Dave and Jarel are great all-around naturalists and general biodiversiasts (I have coined a new word!). And it was much to our pleasure and good fortune that I realized that one of Ohio's only two stations for the incredibly rare Appalachian Filmy Fern, Trichomanes boschianum, happened to be in our assigned area. This semi-subterranean beauty was a "life fern" for both of them, and I was most curious to see what it looked like in winter, so we detoured over to the top secret locale where it grows. Not all was naught on the ornithological front in regards to this detour, either - upon exiting the car, Jarel spotted a female Sharp-shinned Hawk high overhead. These gorgeous and savage little raptors are easily enough missed on CBC's. The sandstone alcove where Appalachian Filmy Fern grows. A small patch of this strange plant hangs from the ceiling in the deepest shadows of the recess, where sunlight never strikes and its feet remain damp due to a constant seepage. We move in closer, our visibility aided by the flash of my Panasonic. Filmy Fern grows in tight clumps, and each frond is but four inches or so in length. One would think that with the abundance of sandstone outcrops and attendant grottoes such as above, this fern would be in numerous locales. Such is not the case. Botanists are no fools, and a great many of these sorts of places have been searched, to no avail. Just last year - or maybe the year prior - one other small population was discovered (really rediscovered) a few miles away. That's it. And this is why I can't divulge the exact location, other than to say Hocking County. But now that you've gotten a taste for the habitat, perhaps you'll go on to find some other stations for Appalachian Filmy Fern. Here's the total North American range of Trichomanes boschianum. Twelve states, and it is endangered or threatened in six of them. It is also found locally in Mexico. Trichomanes is a tropical genus, with dozens of species elsewhere in the world. Deep in the subterranean gloom, the delicate fronds scallop the sandstone roof in the manner of a moss. And there is plenty of the latter in the damp perennial darkness of these sites, including quite a bit of large showy liverworts. Getting decent photos of filmy fern is challenging; one must get the flash just right to avoid overexposure or underexposure. Up close, the "filmy" part of the name makes sense. The tissue is very thin and flimsy; practically like rice paper. Appalachian Filmy Fern leads a tenuous existence here at the absolute northern reaches of its distribution. Threats are threefold, at least. If a small grotto like this one is "discovered" and heavily exploited by people clambering about, the fern is likely to be scrubbed right off the ceiling. Prolonged drought can have ill effects. If poorly understood subterranean aquifers go dry, and the constant seeps that percolate into filmy fern habitat disappear, so will the fern. Finally, extreme and prolonged cold snaps can whack filmy fern colonies, perhaps permanently. On this last score, the future may be rosier if mean winter temperatures continue to rise. In an exclusive, here is actual Appalachian Filmy Fern video - maybe the first on the 'net! You may notice that the company from whence I downloaded this video software wants me to but their goods - no! It's New Year's Day, and predictably, the rabid - or is that avid - listers are feverishly ticking birds. Like racing Greyhounds released from the gate, birder-listers launch into forest and field first thing at the dawn of each new year, darting about notching marks on their checklist. But why isn't anyone out there racking up a Big Mammal Year? This would be different; out of the box if you will. If you embark on this furry quest, you will certainly want to add my personal fav, the Fox Squirrel, Sciurus niger. Dashing chap, eh? Those that live in regions that don't have Fox Squirrels are somewhat deprived. These giant orange-tinted mega-climbers are about as good-looking as it is possible to be and still remain a squirrel. Climbers extraordinaire, they nonetheless are rather Woodchuck-like in that they spend loads of time on the ground. Much more than the Eastern Gray Squirrel, our other large tree squirrel in this neck of the woods. Bold and inquisitive, this shot was taken seconds before the squirrel leapt wildly at me, attaching to my neck and attempting to sever my jugular. Just kidding. Although, compared to Gray Squirrels, these are quite the burly bruisers. Think Arnold as opposed to Richard Simmons. A whopper fox stuffed on a diet rich in acorns can dent the scale at nearly 2.5 pounds. I was subjected to a few guffaws for taking this snap. We were on a birding expedition, you see, and there was precious little time to devote to orange-bellied brushtails like this one. Speaking of tails, like at the leaf-sweeper on this thing! Daniel Boone would have been proud to tie that to his cap. But Daniel probably didn't see nearly as many Fox Squirrels as we do today. They are mammals of open country and scattered woodlots, and have spread eastward and proliferated following the opening up of the original eastern deciduous forest that blanketed much of the Ohio Country. So, should yet another Big Year of birds bore you, try a MBY (Mammal Big Year). It'll be much more challenging, although adding the "Stump-eared Squirrel" - an abomination of a nickname - shouldn't be too hard.